Louisville, KY– Louisville Metro Police Officer Jonathan Hardin, 31, has been arrested for assaulting a child at the school where he was working as a resource officer. Surveillance video released after it was played during a probable cause hearing on Thursday shows Hardin choking out a 13-year-old student back in January. This was only five days after the officer allegedly assaulted another 13-year-old student in an unrelated incident. Hardin was also named in a civil suit with two other officers who have been accused of verbally and physically abusing children during a summer program. Surveillance cameras at the middle school also caught the first incident that took place in the cafeteria on January 22. The footage reportedly shows the officer punch a student in the face so hard that he is knocked to the ground, after accusing him of cutting in line. The boy was subsequently charged with menacing and resisting arrest following the officer’s assault. However, WLKY reports that court records show that the officer made the arrest based on facts that he knew were false. Instead of being fired, suspended, or moved to a position away from children, the officer remained on duty and January 27th he was caught on camera assaulting a child once again. The video from the second incident shows the child running into the officer and knocking him over. After the officer gets back on his feet, he charges at the child, grabs him, and chokes him unconscious as he lifted the middle school student off the ground. After letting him go, it appears the child’s head hit the ground, and the child does not move for 20-25 seconds. Sargeant Rivera of the LMPD has stated that the video is consistent with strangulation. 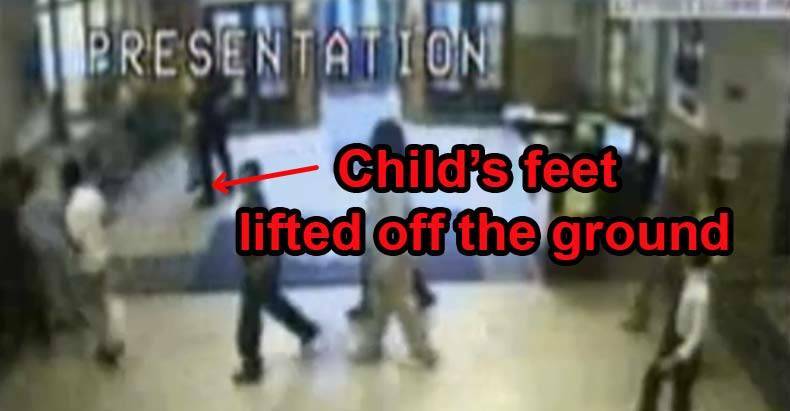 The child has stated that he went to chest-bump the officer, but Hardin lost his balance and fell over. The boy said that he remembered tapping the officers arm to get him to ease up as his vision began to get blurry, and the next thing he remembers is waking up on the ground. Hardin then handcuffed the boy, kept him out of class, and drove him home. He was seen by a doctor who confirmed a brain injury due to loss of blood flow to his brain. Hardin is currently out of jail on bond and is suspended without pay. From a high school girl having her jaw broken by a School Resource Officer who accused her of carrying mace, to a brutal beating over a student using a profanity; brutality at the hands of officers stationed at schools over teenage misbehavior is becoming far too common. Instead of trips to the principle’s office, in police state USA, its trips to jail — or the hospital.